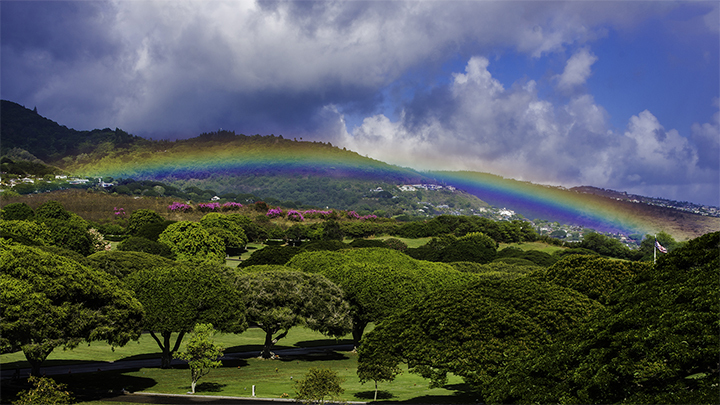 A Rainbow over Punchbowl, a good sign for planning a trip to Hawaii. There are many aspects to planning a trip to Hawaii. Good trip planning can be keys to enjoyable vacations anywhere you go. And Hawaii is no different. We breakdown trip planning to Hawaii in three general categories. First and foremost is figuring out how to get there and how much will it cost. The second is where will you stay and what types of accommodations will suite you. The third is what you want to want to see and how long will you need to stay. 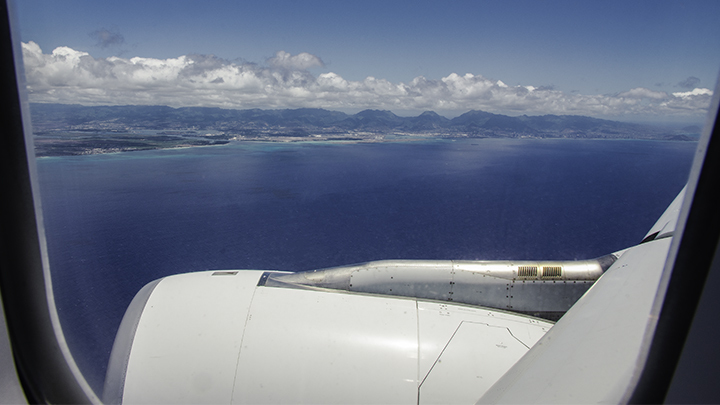 Approaching Hawaii on an inbound flight. Almost all people traveling to Hawaii get there by flying. So how can you get the best flight deals to Hawaii? Generally speaking, the secret to this is timing. Timing generally dictates how expensive flights to Hawaii will be. Typically, airfare to Hawaii is most expensive during Thanksgiving and during the year-end holiday season. It’s also more expensive during summers. Also, the day you travel has a bearing on flight costs. Flying out on Tuesday is generally the least expensive day to fly out to Hawaii, or to anywhere else for that matter. Another factor impacting flight pricing is the amount of competition in the market. Flight prices to Hawaii will almost definitely be headed downward starting in 2018. This is because the granddaddy of all discount carriers, Southwest Airlines, will start service to Hawaii. Industry experts claim that there is a “Southwest Effect” wherever the carrier operates. This is because when Southwest enters a market, prices for flights to that area begin to trend downwards. So you should definitely lookout for great deals when Southwest officially begins service to Hawaii in 2018. 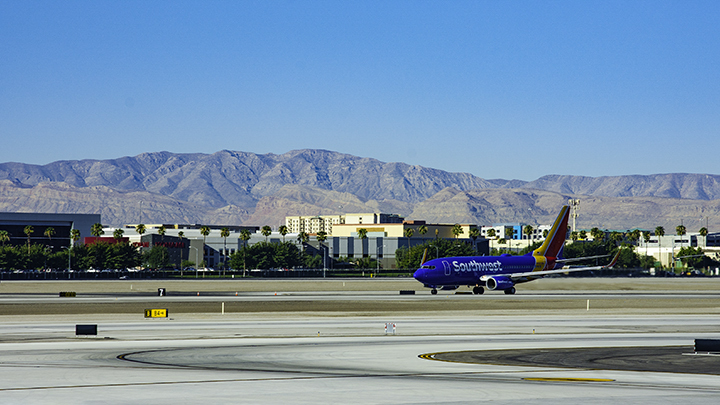 Southwest fight taking off in Las Vegas. The State of Hawaii offers a wide range of accommodations. They’ll range from luxury resorts, budget hotels, condominiums and other types of short term rentals. You’ll find the largest concentration of hotels in Hawaii in a number of areas. World famous Waikiki has the largest inventory of hotel in the State. You will find Waikiki on the island of Oahu. You can also find other resort destinations on Oahu in the Kapolei and Turtle Bay areas. View of Waikiki and its hotels. The outer islands of Maui, Kauai and the Big Island of Hawaii also have prominent resort destinations. You can find concentration of hotels and resorts on Kauai in the Poipu and Princeville areas. While on Maui, you can find them in the Ka’anapali, Kapalua, and Kihei areas. On the Big Island, the major resort areas are in Kona and along the Kohala Coast. But resorts and hotels aside, the main reason for picking where you want to stay should be based on what you want to see in the Aloha State. Each island has its own special attractions and unique things to do. Check out our Activities in Hawaii page for more information on planning a trip to Hawaii. Oahu offers much for the first time visitor to Hawaii. Here, you can get a nice mix of beautiful beaches, scenery, history, culture and shopping. 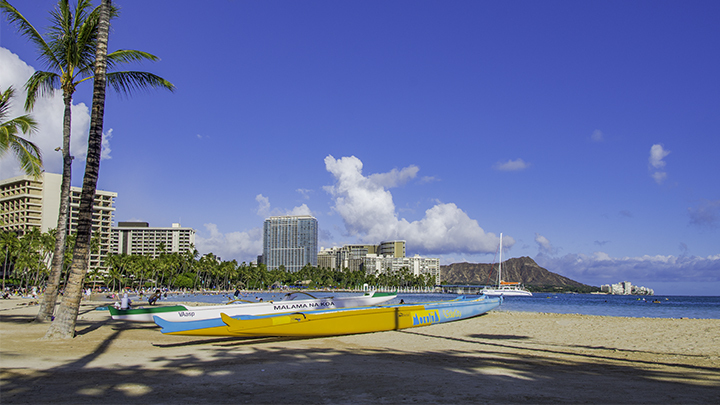 Some of the famous beaches on Oahu include: Waikiki Beach, Hanauma Bay and Kailua Beach. So-called beach experts have even rated Hanauma Bay and Kailua Beach as some of the best beaches in the country. For history and culture buff, Oahu has the Arizona Memorial, the site of America’s first involvement in World War II. It also has the Polynesian Cultural Center showcasing the culture of Polynesian peoples in the Pacific. You can also find the Bishop Museum, the world forecast center for Hawaiian history and heritage. If you like shopping, Oahu is the place for you. It has the largest outdoor shopping center in the world, the Ala Moana Shopping Center. In the Waikiki area, you can also find the Royal Hawaiian Center, the Waikiki Shopping Plaza, the new International Marketplace and many more. If you like scenery like the kind you can find in Jurassic Park, King Kong, Raiders of the Lost Ark, then Kauai is for you. As a matter of fact, this is where Hollywood filmmakers shot them. Some of these places include the Na Pali Cliffs, Hanalei Bay and Anahola Beach. So, why bother looking at the films. There’s nothing like seeing them up close. Kauai also feature places of unimaginable natural beauty. 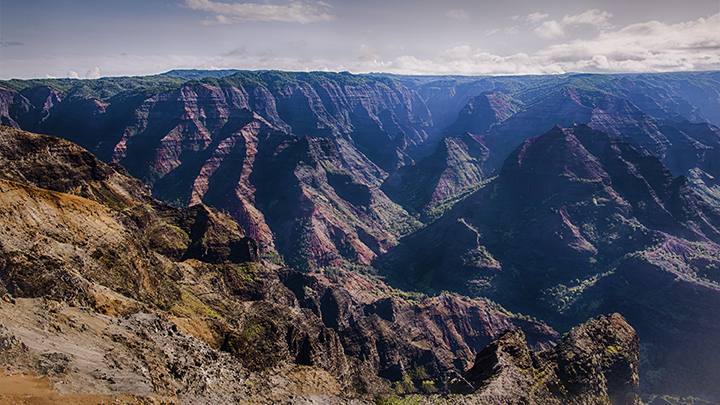 Here, you can find Waimea Canyon. People also call it the Grand Canyon of the Pacific for reasons that you’ll find obvious. There’s also secluded, but beautiful, Kalalau Valley. From the lookout, you can see why so many take the arduous trek down into this mysterious, but alluring valley. The Na Pali Cliffs offer stunning view of isolated pictures beaches, sea caves and waterfalls. But they’re only two ways to see them. The first is by sea and the second is by air. But for the adventurous, the journey may well be worth it. If you like a nice mix of urban and country life, then Maui may be the place for you. The island offers deluxe resort and hotel accommodations on the southern sides of the island. Here, you can relax in luxury and enjoy the scenic beauty of Maui’s southern coast. The Ka’anapali area, according to many, has the nicest beach on the island. And having nearby resort or hotel along side its beaches can certainly add to a most memorable vacation. But if you also like a laid back countryside setting, Maui offers a lot in this regard. In upcountry Maui, you’ll find many charming stores, restaurants and boutique farms. Such farms raise exotic plants ranging from protea flowers, lavender, fresh pineapples and even grapes. There’s also the idyllic Hana Highway. It’s a 64 mile winding road with 59 narrow bridges. When you’re on it, you’ll be treated to a myriad of scenic views, secluded waterfalls and rain forest trails. It’ll take you to the town of Hana, the grave site of the famous aviator Charles Lindbergh, and then to the beautiful Seven Sacred Pools in Kipaluhu. Finally, you’d be remiss in planning a trip to Hawaii if you don’t include a visit to Haleakala National Park. One of the most popular things to do here is to view the morning sunrise at its 10,000 foot summit. The summit offers commanding views of the crater floor, surrounding islands and west Maui . If you like national parks, then the Big Island of Hawaii might be for you. This could be the most intriguing part of planning a trip to Hawaii. The Big Island has world famous Hawaii Volcanoes National Park. 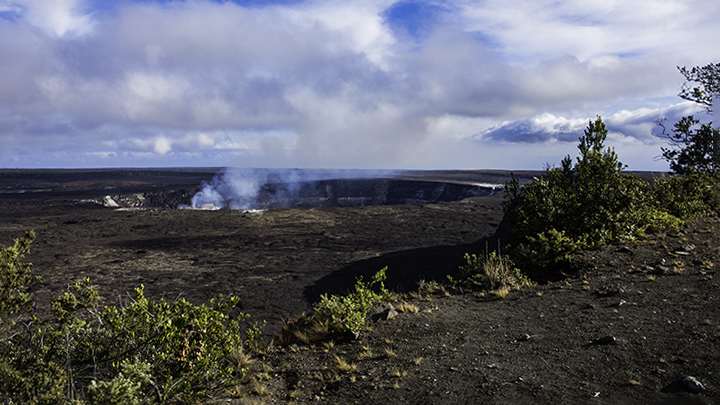 This national park features Kilauea Volcano, which has been continuously erupting since 1983. Here, you can actually see lava flowing to the sea. Sometimes, you can even venture up close to the lava when conditions permit. But you can also view the lava flows from the air or by sea. The Big Island also offers three other historically significant national monuments interpreting what life in ancient Hawaii must have been like. Kilauea Crater on the Big Island. And if you like outdoor activities, the Big Island offers an abundance of opportunities for you to engage in. There are hiking trails galore. You can hike along trails along the Hamakua Coast. Here, you’ll find the secluded Waipio Valley, the former home of many Hawaiian chiefs. There are paths along stunning waterfalls like those that can be found in Akaka Falls State Park. And don’t forget the miles of memorable trails in the rain forest and lava fields of Hawaii Volcanoes National Park. When planning a trip to Hawaii, a good rule of thumb is to budget at least 2 days for each island. You can probably see most of things you want to see in two days, but the pace will not be ideal. If you can, try to spend at least three or more days to see what each island has to offer at a more leisurely pace. Since, the Big Island of Hawaii is larger than the other islands, we recommend adding another day to this rule of thumb.